After that underwhelming big screen debut for DC’s Green Lantern back in 2011, the hero was put on the development back burner and isn’t set to reappear in film form until 2020 for Green Lantern Corps. But what if TV viewers will actually be the next audience to watch the magic man in live-action? That’s the current rumor floating around the interwebs, which has Suits star and the newest Legends of Tomorrow cast member Patrick J. Adams possibly slipping a green ring on his finger for the hero-loaded CW series. You might be wondering how The CW could pull this off, considering the DC Universe has stopped Arrow in the past from using characters that would play heavily in the feature side. And the show will apparently avoid using Hal Jordan for its purposes, reportedly choosing instead to go with the original Green Lantern, Alan Scott. Does that mean our titular heroes will end up getting stuck in the past, where Alan Scott was first utilized, or will he be a modernized take on the character? These answers and more are currently unanswerable, as Bleeding Cool didn’t mention anything beyond Patrick J. Adams taking the part for the Season 1 finale, an episode it was reported a classic DC superhero would appear. Many of our bets were on Booster Gold getting brought into this time-jumping drama, which could obviously still happen, but Green Lantern would be huge. Thankfully, casting someone as well known to TV audiences as Adams is a good sign that his role will indeed be an important one, especially if he stays on for more than just one episode. Green Lantern important, though? We shall see. Created in 1940 by Martin Nodell and Bill Finger, Alan Scott’s Green Lantern got his powers from a mystical meteor and soon found he had the ability to fly, time travel, create things from nothing, and quite a few other powers. He wasn’t yet the alien-centered sci-fi presence that came with Hal Jordan taking Scott’s place as the alter ego, but he still took on classic antagonists like Solomon Grundy and...wait for it…Vandal Savage. (There’s his Legends of Tomorrow link wrapped up in a bow.) He was also revealed to be gay in recent years when rebooted as Earth-2's Green Lantern, but it’s definitely not clear how the character would be handled if he indeed makes it to Legends. 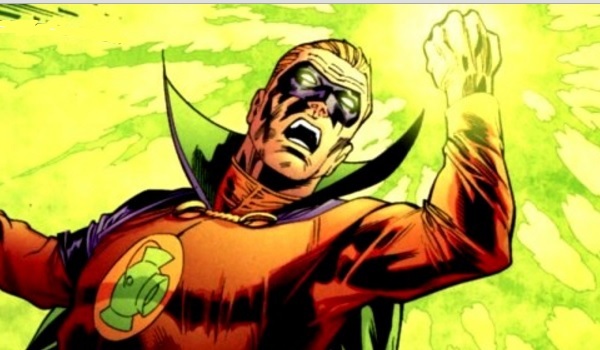 This will be Alan Scott’s second appearance in live-action, as he previously appeared in a Smallville episode as portrayed by Doug Pinton. Now, Arrow has already thrown us for a loop where Green Lantern is concerned, dropping easter eggs and allowing audiences to think that Diggle might have been prepped for the ringbearing hero. And Legends of Tomorrow also got our goat when a future-set episode gave us a Green Arrow switcheroo for Connor Hawke. So even if Adams is indeed Green Lantern Alan Scott, there’s no guaranteeing that it’ll be played quite so straightforward. Legends of Tomorrow airs Thursday nights on The CW, with Season 2 presumably coming either in the fall or in the midseason. What are you guys thinking? Do You Think Legends Of Tomorrow Will Introduce Green Lantern?